Trace Palmer & Kooper King Win State Championship in Utah. The first High School event of the new year brought forty-six teams to the Harris Chain of Lakes, from all across the state of Florida. 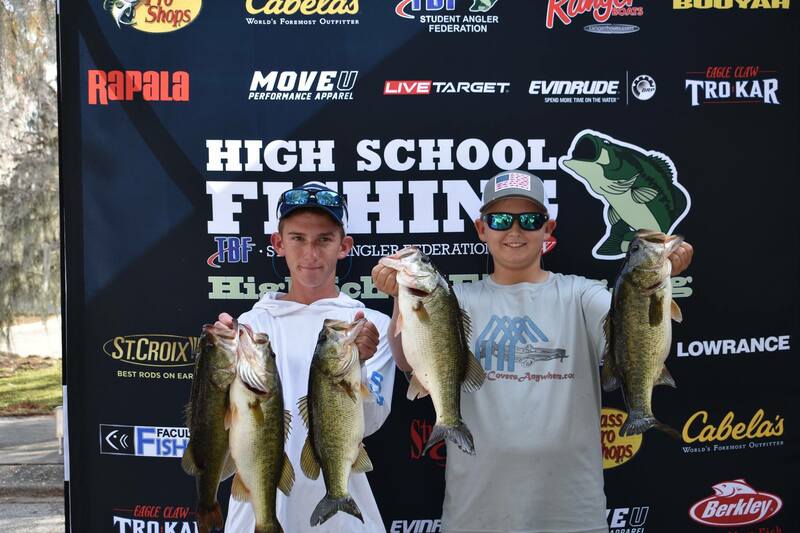 They were anxious to try and qualify for the 2019 High School Fishing National Championship, coming up in June at Pickwick Lake in Florence, Alabama. Joey Bloom & Dylan Westhelle bested the field with an impressive limit that weighed 17.04 pounds, to take home the win. The Seminole Junior Anglers also claimed the Big Bass award for the day with a 6.04 largemouth, which got them two Lew’s Reels for their efforts. 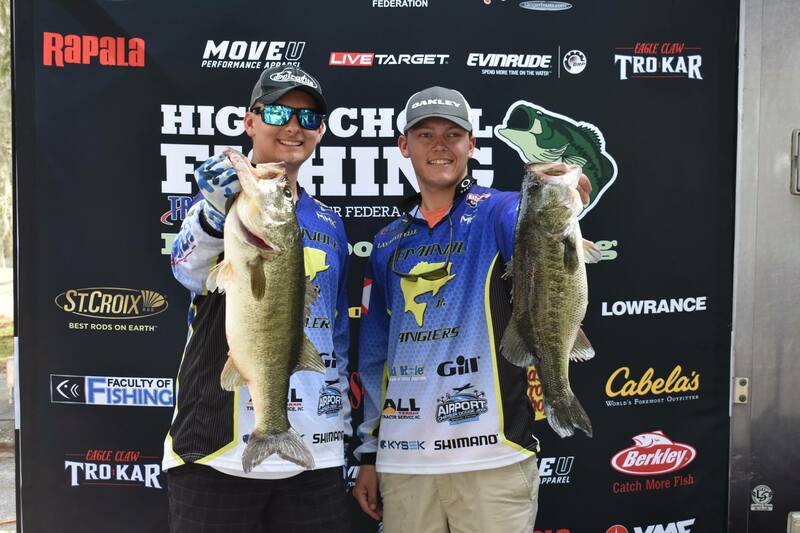 The Clay High School Blue Devils team of Dalton Barnard and Parker Stalvey brought 16.09 pounds to the scales and also claimed a qualifying spot by finishing in second place. Rounding out the top three spots was Cody Sharp and Justin Wallace from Bartow High School. Their limit tipped the scales at 16.05 pounds. The last National Championship qualifying spot went to Dawson Turner and Grady Johnson who brought 15.14 pounds to the scales to finish fourth. When asked on stage about how they were catching their fish, numerous patterns seemed to be producing fish. Most anglers were reportedly fishing around the outside edges of submerged grass-lines in about 8 -15 feet of water. Some of the best baits were Speed Craws, Senkos, Flukes and Rattletraps. Most anglers said they were catching between 7-10 keeper fish during the day, but most were not able to get the big bite they needed to seal the win. The High School fishing World Fnals and National Championship will be June 18-22 at Florence, AL. 2019 Texas SAF High School State Championship is in the books now. Held on Feb. 2nd on Lake LBJ, in Marble Falls TX. Due to the rapid growth of High School Fishing in Texas SAF founded the national high school program in 2007 finding a open date for the SAF championship is harder each year, that coupled with extreme low water conditions and very limited ramp access to this beautiful body of water and great fishery, the numbers were not what we wanted this year but the fishing was great! We will be announcing the 2020 events very early to help all the clubs avoid conflicts. However all that didn’t stop some of our great student anglers from showing up and competing in a very tough field of anglers. 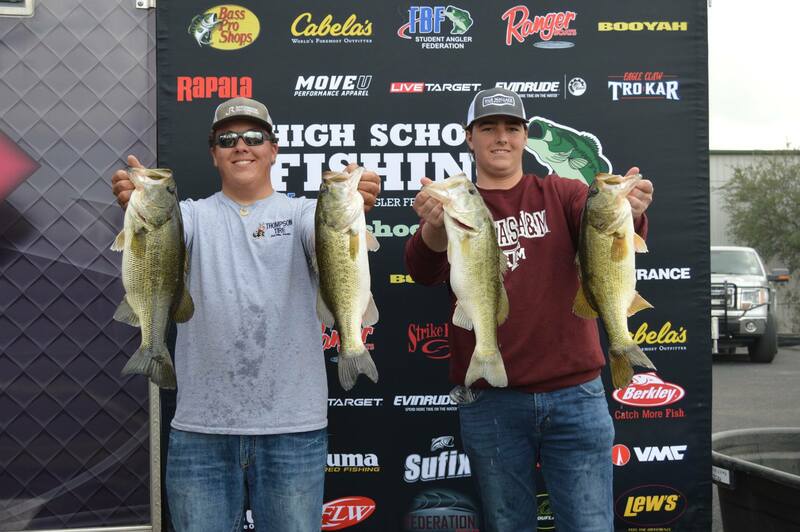 We are glad to announce the State Championship was awarded to Colton Zahn, and Logan Drake of Team Tight Lines. The 2019 State Champs had an impressive catch weighing in at 24 pounds. Colton, and Logan will be making the trip to Florence Alabama to compete in the High School World Finals and National Championship in June 18-22. Not only did they qualify for the National Championship they received trophies, Cabela’s/Bass Pro Shops Gift Cards and a great prize pack for big bag of the event sponsored By Booyah Baits. Second place team head the ead for quite a while and made all other work hard ot beat them. It was awarded to Sid Wallace and Dylan Thompson representing the Central Bobcats who came to the stage with a impressive 17.14 pounds. Third place team goes to Hunter Amidon and Justin Andrade flying colors from James Bowie High School. Their bag of fish was 15.02 . Hunter and Justin also had the Big Bass award of the day that weighed in at 6.9 pounds. 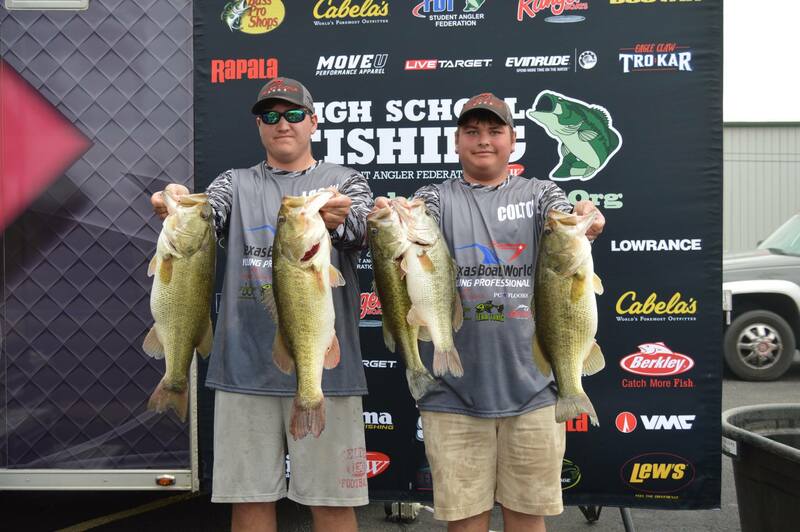 Fourth was awarded to Landen Bennett and Billy Eaton also representing Team Tight Lines with 15.02 . Every team that weighed in 5 fish all alive was awarded a Berkley Five Alive prize as well. We had a 100% live fish release great job by the anglers on fish care. Here from the National Office we want to thank all of our SAF Anglers and parents who participated on Lake LBJ. Good Luck to you all in your upcoming Year. LEXINGTON, KY (February 4, 2019) – Registration for teams participating in the April 27 Kentucky High School Athletic Association (KHSAA) bass fishing regionals is now open. All registrations will take place at www.highschoolfishing.org. To enter, teams must be members of an approved high school fishing team at a KHSAA member school. Students wanting to participate at schools that have not yet authorized a bass fishing team should contact their athletic director. Each school can enter up to and including six boats for regional competition. Each boat must be entered separately and include the names of the two anglers who will start the day fishing out of the boat (each boat is allowed up to four anglers, with only two fishing at any given time). The name of the boat captain who will operate the boat for the students while on the water must also be provided at the time of entry. The names of any substitute anglers or boat captains will be recorded at the registration/rules meeting for each regional. Boat takeoff position will be determined by random computer draw and will be assigned at the rules meeting for each event. Click here to view the region your school belongs to, and click here to register. Click here to view the KHSAA bass fishing rules. These rules pertain only to KHSAA events. The KHSAA bass fishing state championship hosted by Calvert City, KY, will be held Friday and Saturday, May 10-11 on Kentucky Lake out of Kentucky Dam Marina. Contact Michael Barren, KHSAA at mbarren@khsaa.org; Scott Ellison, FLW at scott.ellison@flwfishing.com; or Randy Sullivan, SAF/TBF at randy@federationangler.com with any questions.